This museum depicting the life and times of the men and women of the American West is so much fun! In the Indian teepee, pick up, feel, and read about the uses of items such as a real beaver skin hanging on a peg; learn why you would have a turtle shell in your teepee; have your picture taken with life sized photos of Annie Oakley or Buffalo Bill; put on western clothes and jump up onto a stationary life-sized horse. Try your luck roping a stationary calf. Yee Haw! You can even make up your own brand with branding iron components and elements. Kids of all ages will enjoy the history portrayed all around you, both inside and out. From the mountain top outside the Museum, the white capped Colorado Rocky Mountain peaks loom up behind you to the west, all of Metro Denver spreads out far below with the plains beyond that to the horizon in the east, you are standing in a most gorgeous panoramic picture postcard. Most of us have heard the name Buffalo Bill, who was born William Frederick Cody. When he was a Scout for the military of the Old West, part of his scouting job was to locate food sources for the troops. They soldiers nicknamed him Buffalo Bill for his skill hunting buffalo. From 1860 when Cody, just fourteen, made his first trip up the mountains to look out over the plains and the tiny cow-town of Denver until his death, Buffalo Bill had a continuous love affair with the mountains of Colorado and a great respect for his friends, the Native Americans. 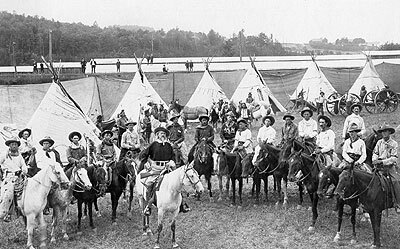 Cody started his Wild West show to show the world what his “Wild West” was like and the people and animals who populated it — Indians, Cowboys, sharpshooters, and more. This outdoor show, designed to educate and entertain, had demonstrations of bronco riding, roping and other western skills that can be seen today in our modern rodeos. For over 30 years Bill Cody did indeed show the world his Wild West Show—from a command performance in 1887 for Queen Victoria of England, to all over Europe, the United States and Canada. Buffalo Bill Cody created a show as a remembrance of his time. Buffalo Bill's request to be buried on a mountain top overlooking Denver and today's museum has been the continuation of his dream to show the world his Old West. Much like his Wild West Show, the museum depicts cowboys and native American lifestyles, women of the West, antique firearms, Western art including Frederick Remington’s “Portrait of a Ranch Hand,” all are brought to life again in your mind. Have a great fun day! Continue your journey into our American Western past and hop back on I-70 east to Lookout Mountain exit 256, follow the signs to Buffalo Bill's Grave and Museum. November 1 - April 30: 9:00 a.m. to 4:00 p.m.
Closed Mondays during the winter months. Address: 987 1/2 Lookout Mountain Road, Golden, CO 80401.